Los Angeles – January 03, 2018 – Global Net Solutions (GNS), an innovator in facilities-based smart security and business intelligence solutions, today unveiled its S-Badge, a revolutionary IoT-based security solution designed to improve safety and tackle insider threats and breaches in high security environments, such as airports, hospitals, school districts and college campuses, government agencies and more. 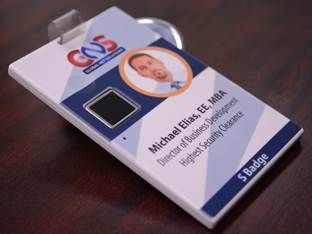 Unlike other systems, the S-Badge leverages the latest IoT technology, artificial intelligence (AI) and machine learning to enhance security and unlock an entirely new range of functionality and data that go far beyond today’s standards. The proprietary, turn-key solution utilizes an innovative system of on-site LoRa gateways and a battery-smart, all-in-one authentication badge that verifies a user‘s identity based on location, a biometric signature and a preprogrammed NFC chip. The S-Badge also features a panic button to discreetly signal an emergency, along with the badges’ location. GNS is a California-based business intelligence and Internet of Things (IoT) development, design and manufacturing company. For more information, visit https://s-badge.com/.